When Fall rolls around each year, I think of bursting colors from changing leaves, cooler temperatures, and the rapidly approaching holidays. What often slips my mind is tree planting – even though Fall is prime season for planting trees! The key to healthy adult trees is encouraging good root growth from the start. During the spring months, soil may be warmer and less damp. Cool temperatures and adequate rainfall in the Fall enables the root systems to grow before the hot summer returns. Summer heat and drought aren’t the only culprits threatening trees. In fact, the Emerald Ash Borer disease has proved fatal to tens of millions of trees in the Midwest alone. Planting and taking care of trees benefit our environment in many ways. They beautify communities, purify the air, barricade loud noise, provide shade, reduce energy costs, help to reduce crime rates, remove contaminants from polluted soil, and increase real estate values. That’s more than enough reason to plant a tree! Here’s how! TREE PLANTING CUT 02 from Tony Mottley on Vimeo. 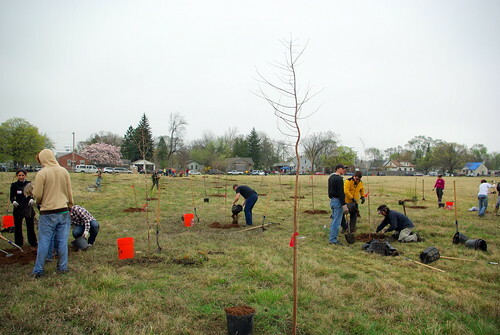 The Greening of Detroit has a goal of putting 7,000 trees in Detroit neighborhoods by the end of 2012. If you don’t need a tree on your own property, you can support the city of Detroit in its efforts to reforest.